made in organic cotton (GOTS label) is the perfect babywearing tool from birth. With a wrap, you can babywear and reassure your baby from the very first hours of her life. 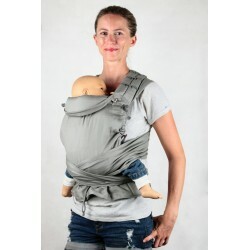 Your Ling Ling d’amour wrap lets you to carry your baby close to you and reassure her. 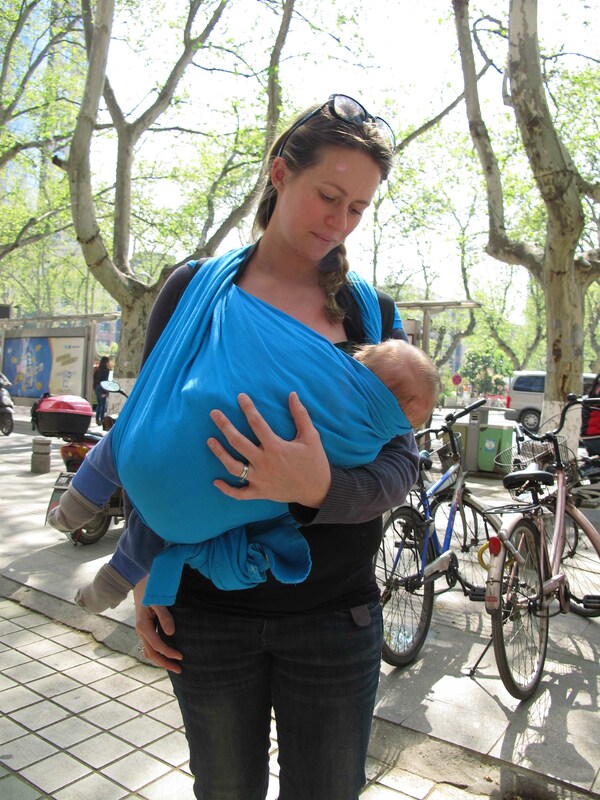 Babywearing with a wrap guarantees a physiological positioning for your baby. Her back is supported in its natural curve, with her knees high up. The broken twill weave offers a diagonal elasticity, ideal for adjusting from rail to rail and offering a comfortable cocoon to your baby. Our Ling Ling d’amour baby wrap is comfortable for both your baby and you. It can be used from birth (approx. 3,5kg) up to 3 years old (max. 15kg). The wrap, a versatile and evolutive baby carrier! You can carry your newborn close to you, chest to chest. After a few weeks, you can position your baby on your side; a few carries are possible, according to the length of the wrap. When you feel ready, you can carry your baby on your back. This way, you can fulfil her needs for closeness and reassurance so that she can discover the world at her own pace, all the while keeping your freedom of movement. The wrap makes your life as a parent easier, by keeping both your hands free. The baby wrap is your ally to nurse your baby both discreetly and quickly: below in the Cradle hold, from a Kangaroo Carry tied under baby’s bum using a short wrap. To achieve this, you just need to loosen the knot under your baby’s bottom to get some slack and bring your baby down to breast level. Once your baby is done, you shall tighten the wrap again to bring baby back up, close enough to kiss. You can also bottle-feed your baby in this way. LLA’s baby wrap is made in organic cotton (GOTS label) and woven in broken twill for the Daïcaling and SoL range. The Aïon range (Deep Ocean and Papaya colourways) is woven in dobby-weave (using a Jacquard loom). A label is sewn on the hem so that the middle of the wrap is easy to spot when tying. The hems are sewn in a different colour, so you can notice at once if your wrap gets twisted. Special reinforcement stitches are sewn on the hems for a greater strength. 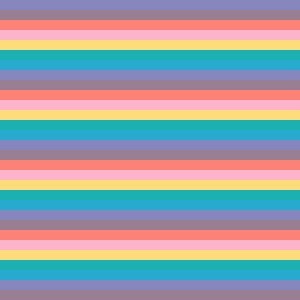 The baby wrap is available in different lengths: 3.70m, 4.50m and 5.20m (in order to choose the correct length, please refer to the guidelines below!). The tails are cut straight for Daïcaling; they are tapered for SoL and Aïon for a more elegant drape. It is a light wrap: it weighs 210 gr/m² for the Daïcaling collection and 220 gr/m² for the Aïon et SoL collections. Our dyes are guaranteed free of any toxic substance. Our baby wrap has been tested and approved by a certified testing laboratory, using a standard test procedure based on NF EN 13209.2. It complies with all safety requirements. 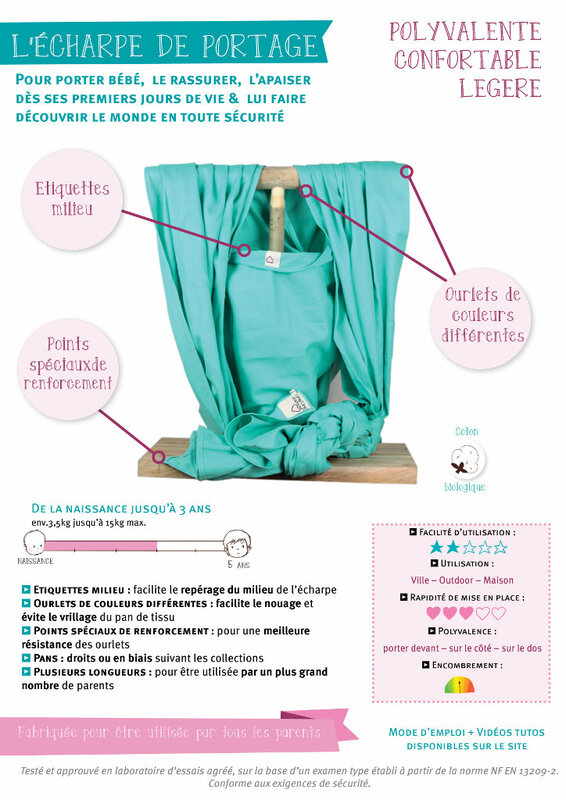 The Ling Ling d’amour baby wrap comes with its instructional leaflet, which contains illustrated step-by-step instructions for various carries as well as safety guidelines. Many videos are also available on the Ling Ling d’amour YouTube Channel. Which wrap size should you choose? - the mostly used type of carries. Are you a babywearing beginner? - if you’re a size EU46 or more, we recommend a 5m20 long wrap. 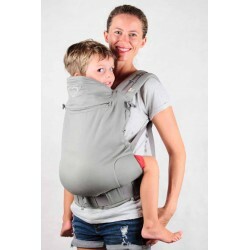 You will then be able to do most usual carries (FWCC, Kangaroo…) and carry your baby comfortably. Are you already experienced with a wrap? Daïcaling, Aïon, SoL: how to choose? The Daïcaling and SoL colletions both use the same broken-twill weave. This special weave offers a good babywearing comfort. Their differences lay in the dyeing process: Daïcaling uses fabric-dyeing whereas SoL uses yarn-dyeing. The Aïon collection is a dobby-weave. This weave is ideal for any season, fluid, almost « airy ». It has more diagonal elasticity to closely fit both your baby’s and your body. It feels different from the broken twill weave as it is woven on a Jacquard loom. It will however need a few days’ uses to be broken in and softened. Our three collections have almost the same weight: 210 g/m2 for Daïcaling et 220 g/m2 for SoL and Aïon. This makes them light wraps that can be used comfortably all year long. Laëtitia N. on 11/28/2018 Je suis très contente de mon article que j’ai acheter. Une super qualité. Stéphanie B. on 05/24/2018 Fait très bien son job soutenante pratique. Produit de qualité et livraison rapide. Top ! Aurélie C. on 01/09/2018 Très belle écharpe ! Le tissus est doux et résistant. Kaneï C. on 10/09/2017 Taille idéale et couleur parfaite ! Francesca J. on 09/15/2017 C'est ma première écharpe de portage, je l'apprécie pour sa légèreté, contrairement à des écharpes avec élastane, elle ne tient pas chaud. Elle est abordable et le tissage semble de qualité. Le tissus est bien souple, mais pas spécialement doux. Elle permet de porter un enfant jusqu'à 3 ans et sa couleur est superbe, un jolie prune. Seul remarque : une poignée serait bienvenue sur la pochette qui permet de ranger l'écharpe. Ce qui permettrait de facilement emporter cette dernière à la façon d'un parapluie compact. Sara C. on 08/08/2017 Une écharpe de bonne qualité, qui n'attends plus que l'arrivée de bébé pour être utilisée. Roxane D. on 07/04/2017 Digne d'une écharpe. Le noir n'est pas une bonne idée pour l'été par contre. ..
Sandrine P. on 06/27/2017 L'écharpe est de très bonne qualité et la couleur est très jolie. Néanmoins j'aurais dû prendre la taille en dessous. Hélène M. on 06/06/2017 Écharpe très facile à utiliser. Les explications sont fournies avec et simple à comprendre. 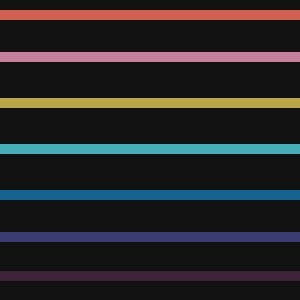 Cecile C. on 06/06/2017 Produit conforme à la description, la longueur permet différents types de portage, la couleur est sympa. Bon rapport qualité prix. J'aime bcp la petite pochette qui permet de ranger l'écharpe et la notice pour réaliser les nouages est très pratique.